Yiwu belts are located in international trade city district 2. The different sizes and different styles could meet all your needs. 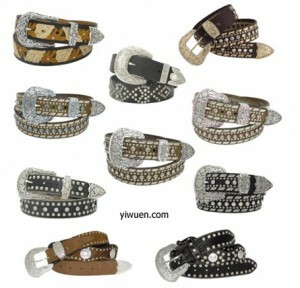 However, Yiwu belts for women and men are rather different; the procedures to make them also have a big difference. We can depart Yiwu belts into several parts like needle buckle belts, pull clasp belts and automatic buckle belts. We also can sort the belts into waist belts, narrow belts, fancy leather belts and others. The material of Yiwu belts are especially made of leather. Some belts with copper design are also a popular all the way. The colorful and special designs for the fabric and ribbon belts are very amazing. These days, a new type of Yiwu belts which is made by hand is rather popular, and their work is very precisely. If you would like to know more information about Yiwu belts, please feel free to contact us, we are NO 1 Yiwu agent, and we will greatly appreciate your early inquiry.